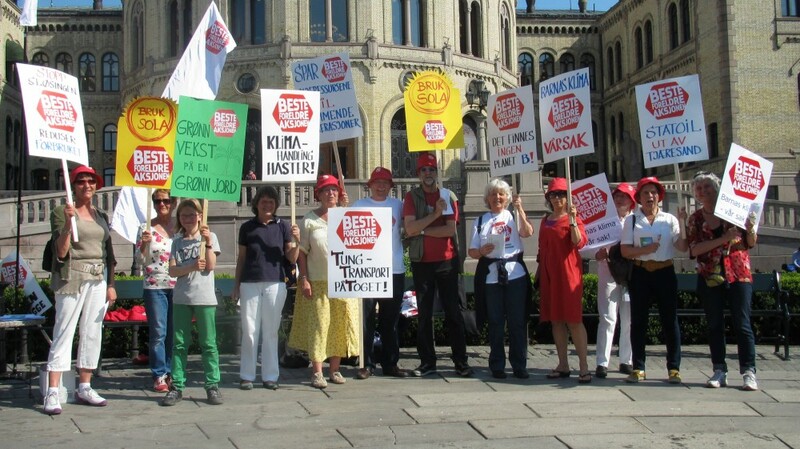 Grandparent activists demonstrating in front of the Parliament building in Oslo. We owe all children a planet Earth as wonderful as the one we have enjoyed! The Norwegian Grandparents Climate Campaign, GCC, was formed in 2006 by a group of concerned elders, many of whom formerly held influential positions in Norwegian society. The initiative came from Halfdan Wiik, librarian and environmental activist living on the island of Stord south of Bergen. Today GCC is an independent grassroots organization with well over 2200 members (January 2019), with regional groups across Norway and run by a Members’ steering-committee. GCC has proved a significant voice in the public debate on the state of Norway’s climate policy at home and abroad. CO2 emissions that have been on the rise for decades, despite «climate goals» which are clearly being non-committal. Drilling for oil in the Arctic ocean – environmentally a particularly sensitive area. The far-reaching tax subsidies that are beeing bestowed on oil and gas activities, pointing backwards and not forwards for the Norwegian economy. The decision by the 70 % State-owned oil company Equinor (until recently called Statoil), to invest in shale gas extraction in Texas, and drilling in the Great Australian Bight. Continued focus on improvements in road and air, to the detriment of low emission rail and sea, transport. A very high level of personal consumption, which is putting the Earth’s finite resources under immense strain.